Important Note: The greater number of ICD-10-CM diagnostic codes means an even bigger need for detailed clinical documentation. Making the right code selection requires having adequate clinical detail and, under ICD-10-CM, clinician's documentation willmore than evertranslate into reimbursement gained or lost. • Get 5 CEUs from AAPC and our certificate of "CDI Skills Proficiency" when you pass the online exam. • Diagnoses and Procedures—Covers documentation forCPT®, HCPCS, and ICD-10-CMcoding. Enhance your code selections with documentation requirements for all three coding systems. 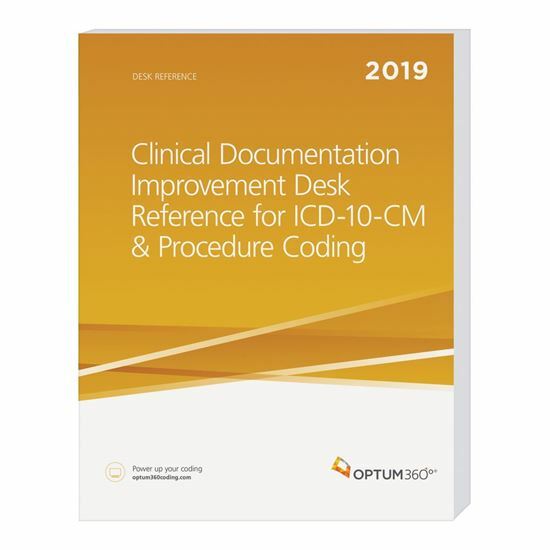 • Optum360 Edge—The“Clinician’s Checklist for ICD-10-CM.” Make copies of this handy tri-fold, pocketsize card for every clinician. Provides powerful documentation tips for the 5 most important chronic and acute conditions. • Optum360 Edge—HCC and QPP icon alerts added at the code level to aid in coding. • Optum360 Edge—A list of medications is noted for codes that are deemed applicable. • Terminology Translator. This unique feature is now included at the code level. • Physician Documentation Training.Show physicians what they need to document.Includes 21 detailed documentation checklists for the most common and complex medical conditions. • Don’t teach your clinicians to code ICD-10-CM. Instead show them what you need for optimal code assignment. • See key terms.Confirm accurate code selection for every chapter of ICD-10-CM. • Know when ICD-10-CM differs dramatically from ICD-9-CM. Alerts and warnings in the text of this book call your attention to situations where ICD-10-CM coding protocols are different from ICD-9-CM and significantly affect code choices. • Streamline the query process. Show physicians which medical terms are essential to assigning codes in ICD-10-CM. Includes best practice query forms that get results without unduly influencing clinicians.